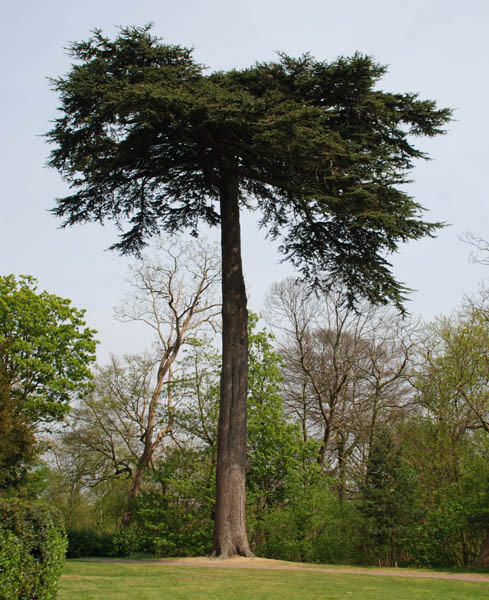 The beautiful Leeds Castle lies in a nice parkland wich inhabits several nice big trees, like this typical Cedar of Lebanon (Cedrus libani). This species was first brought to Britain as seed by an Arabic scholar, Dr Edward Pocock, in 1638/ 39. He planted this tree on his rectory lawn at Childrey in 1646 and it is believed to be the oldest Cedar in Britain. The species soon became a familiar sight in the grounds of large estates as it was widely used by the 18th century landscape gardener Lancelot "Capability" Brown, who also designed the park of Leeds Castle. While in the rich British soil they grow fast, they are very large after a century or more, but most of them are blown over or heavily battered before they reach two centuries by the heavy storms of this country. Still, some specimens from the mid-eighteenth centure survive till now and they are huge. 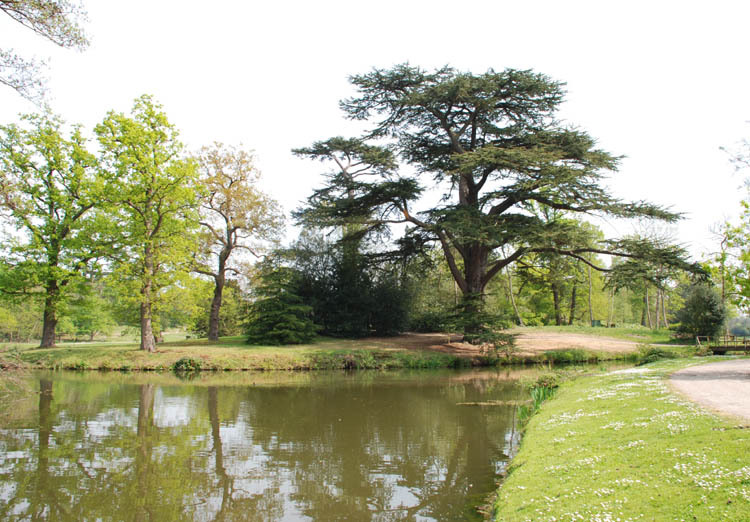 The Cedar above will be planted sometime in the 19th century and is of the frequently seen multi-stem type. Some other large Cedars at Leeds Castle are single-stemmed and show the loss of several large limbs, probably thanks to the gale of 1987. At the Southwestern side of London another beautiful park, Painshill, can be found. It was created in the 18th century by Charles Hamilton, who builded a landscape with artificial elements, like a grotto, a Chinese bridge, a gothic temple and a huge waterwheel. It is also worthwile fore its trees. Among these several large Cedars of Lebanon stand out. This one is a typical singletrunked specimen with a characteristic broad silhouet with flat branche-platforms. 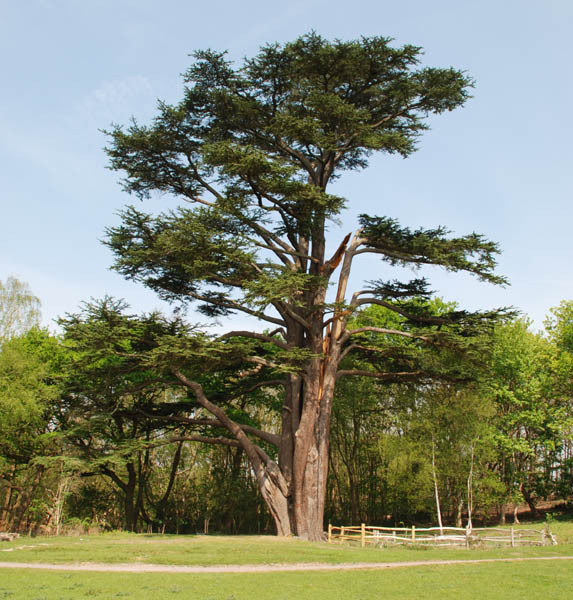 The largest Cedar of Painshill is even one of the largest in the UK, with a girth of 10,28 m near the ground and a height of 36 m. Alas it has lost some of its large branches in the storm of Januari 18, 2007. 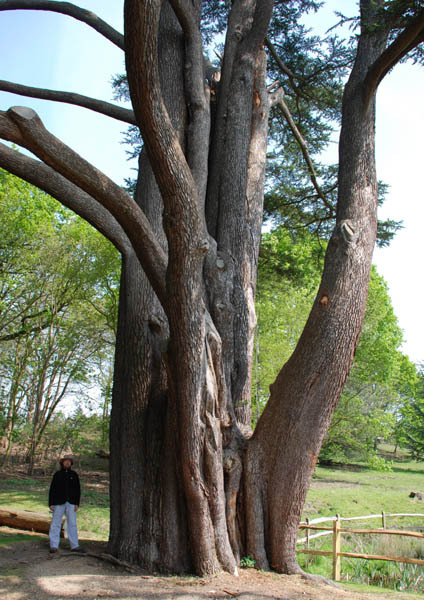 The great cedar is of the multy trunk-type, the trunks being very tall in this case. A third Cedar in Painshill has a very different character, with one tall bole and only a small crown. 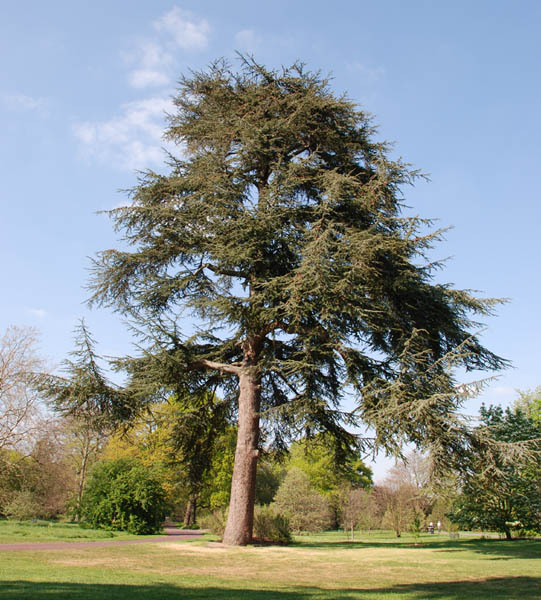 For reasons of comparison here a large Blue Atlas cedar (Cedrus atlantica 'glauca'), photographed in Kew Gardens, London. The color of the needles is more bluish-grey while the branches have a more upright habit of growth.